The business partnership consists of two or more owners who agree among themselves to contribute capital, establish the business, and expect for returns. It is registered with the Securities and Exchange Commission, a national government regulatory agency, and that means it requires more paper works as compared to sole proprietorship type of business. The corporation is created by or composed of natural persons not less than 5 but maximum of 15. It is established by the Corporation Code, and just like the business partnership, it is registered with the Securities and Exchange Commission. The Corporation Code of the Philippines Batas Pambansa Bilang 68 provides terms and definitions of corporation and its underlying concepts, the laws and regulations in the establishment and operation of the corporation, as well as the basic powers and capacity of the corporation, and many more. 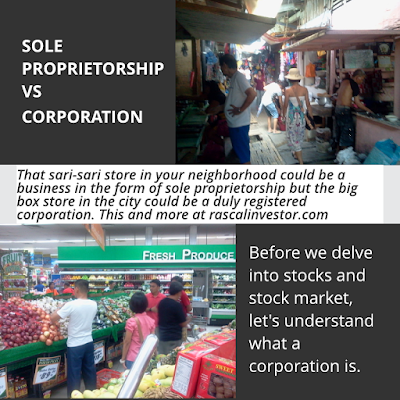 As the Rascal Investor, I wrote this post to give you adequate background and great deal of appreciation on stocks traded in the Philippine stock market but, here I will limit the proceeding discussion up to only just comparisons between sole proprietorship and corporation, and hence not talk anymore about the partnership type of business. 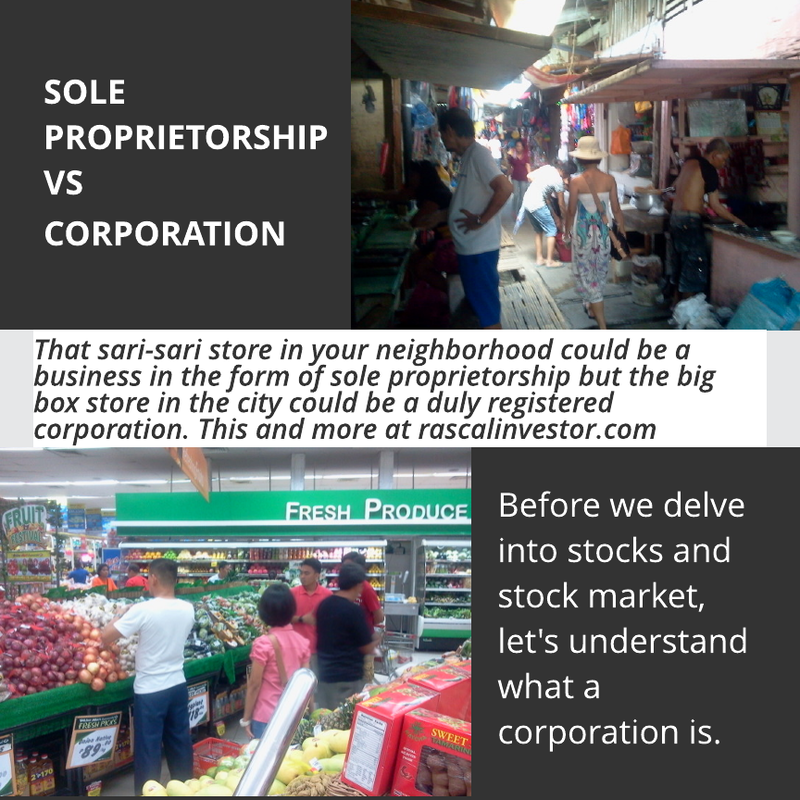 Take this simple visualization: that sari-sari store in your neighborhood is most likely registered as sole proprietorship and not a corporation but, that sachet of shampoo you bought from such store was manufactured by a certain corporation. After half an hour, you’ve freshened up yourself with that great smelling shampoo and you’re good to go to the mall. You wonder if such favorite mall of yours is owned by a corporation? My answer is... yes probably. Next you’ve arrived at the city road and decided to take a taxi cab because it’s too hot and humid outside. The owner/operator of the cab could be identified as a business of sole proprietorship but, the car is surely manufactured by a business corporation. Well that's just it and I thought maybe this article would serve as valuable reference to everyone and anyone who have been a subscriber of mine. Maybe you find an affinity in me and we are in the same page towards personal financial management and investing so we both have dreams to grow and diversify our assets. This post is just meant to prepare you to mind-blowing activities like buying and selling of stocks traded in Philippine Stock Exchange via stock broker.